the necessities of her duties, authority,   every year. a multidimensional picture of her perfor-  our employees in 2017. The  purpose  of  the  BOLD  Program  which  has  been  on  since  2011   to-one interviews with university students. NGTs   candidates at the market. 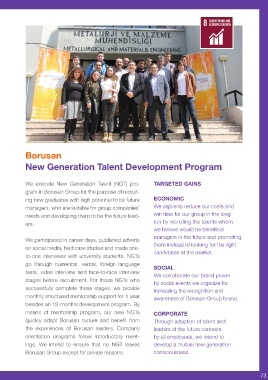 The program that involved the participation of our 109 managers in   monthly structured mentorship support for 1 year   awareness of Borusan Group brand.